Unfortunately time constraints (i.e my day job) keep getting in the way of me updating this site so all Ive been able to do so far for the Notts County Nickname page is a very basic bit of background. 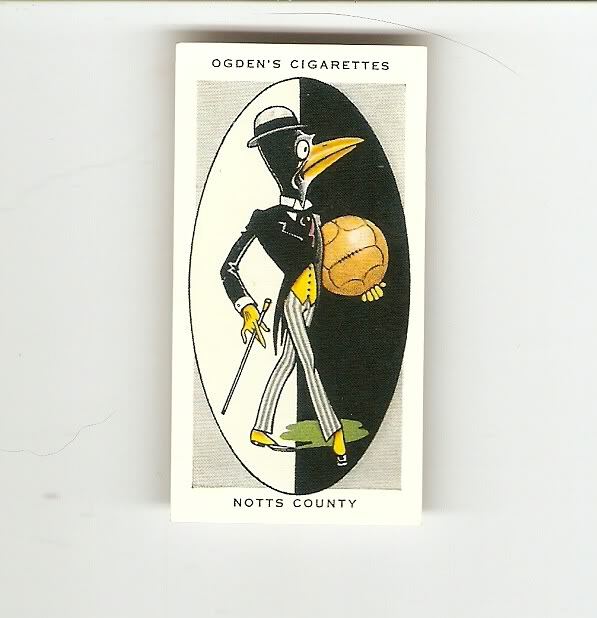 Ive shown below a football cigarette card from the Ogdens AFC Nicknames series that shows a caricature that depicts a "Magpie", which of course is Notts Countys nickname !! "The County is the oldest of the two clubs in Nottingham, being formed in 1862, before the Forest. Known both as the “Magpies” (the name fitting the black and white jerseys), and the “Lambs” (the country being notable for its sheep). Notts is one of the oldest clubs in the country. They first played for the Cup in 1877, and they won the trophy in 1894, defeating Bolton Wnderers in the Final. They were in the Third Division of the League for one season, but are now back in the Second, and the prospects are more favourable than for some time".